High ranking officials at The Mother Church mismanaged an attempt at a cable network and lost the church millions. This mismanagement also caused budget problems with periodicals and The Christian Science Monitor. 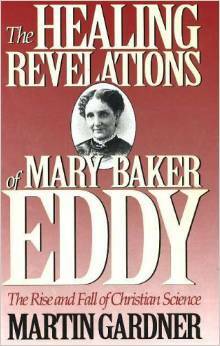 To compensate for the monetary losses, they published the highly controversial book that claimed Ms. Eddy was the Woman in Revelation — The Destiny of the Mother Church by Bliss Knapp so they could get the funds from the Knapp estate (they could only get the money if they published the book). The bungling of the media empire and publishing of Destiny caused some rifts within the church and the membership. I vaguely remember some heated discussion about wether or not Destiny should grace the shelves of our local church’s Reading Room, but I was too young to be involved (or even really told what was going on). Chapter five is full of interesting characters, with equally interesting motives. It provides well researched insights into the workings of the Mother Church attempts at public outreach from the 1950s-1990s. Part 6, is entitled “God Will Do the Rest”: Resurrecting Christian Science. Starting on page 399 and continuing through page 447, this part has only five sections. Part six reflects on the cold realities of the Church’s present situation, and the Church’s denial. Dismal figures from the 1990s (yes, the numbers are old, but they’re not trending up) of declining Journal, Sentinel, and Monitor subscriptions reflect the declining participation, and diminished numbers of Christian Scientists. Fraser also notes declining numbers of Christian Science practitioners, as well as an excess of job openings that require class taught Christian Scientists, at the Mother Church and other C.S. institutions. Fraser touches on the 1990s campaign by then-member of the Board of Directors, Virginia Harris, to make Science and Health relevant, with the release of a trade edition designed to be sold in bookstores (not just Reading Rooms) to people seeking books on spirituality. Harris gave interviews in the New York Times, and successfully had Ms. Eddy entered into the National Woman’s Hall of Fame. Harris has also given talks before the Harvard Medical School’s “Spirituality and Healing in Medicine” courses (GPC 408), giving her lectures an air of credibility — and pushing Christian Science into the realm of alternative health care. Fraser points out the 1990s trend for books on the connections of health and spirituality, and Harris did her best to capitalize on that. With Christian Science neatly repackaged as alternative healthcare some important details were overlooked: there was no scientific verification of anecdotal healings; some confusion over the issue of radical reliance and withholding medical treatment from children. Easy details to gloss over. Fraser is quite right with the sub-headings “accentuating the positive” and “eliminating the negative.” The Mother Church, and indeed most Christian Scientists are quite good a pointing out all the healings they’ve had — there are “thousands” of documented “healings.” For them it is not a mere religion, Christian Science is a Science, “God’s laws” are provable. Fraser pulls out the age old 2+2=4 not 5 example used by Sunday School teachers everywhere. “Finding the correct answer in math is the same as realizing the correct answer in metaphysics; everything else follows” (GPC 417) — the correct answer is, of course, Christian Science. Christian Scientists are eager to tout modern advances in physics as backing up Ms. Eddy’s claims about reality and matter, and enjoy telling apocryphal stories of Albert Einstein‘s interest in Christian Science (GPC 418). 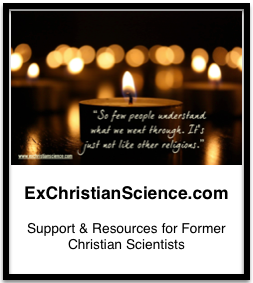 In a similar vein, Christian Scientists are eager to share their testimonies of healing, modern testimonies are all pretty much the same: I had a brief nondescript problem, I corrected my thought using some passages and C.S. logic/hymns/S&H readings, and the problem resolved — completely and totally. With all the focus on the positive it seems the church would prefer that the negative just go away. The Church does not maintain records of the deaths of children or adults. Fraser lists several examples of falsified or selectively edited testimonials, and the long gone “Questions and Discussion” department (1889-1893) of the Journal which fielded questions from Christian Scientists who were not getting the results they’d prayed for (GPC 429). Fraser cites several damning studies, including one that compared Principia students with Universe of of Kansas students. Principia students had notably lower life expectancies, even though they abstained from alcohol and tobacco (GPC 434). Finally, Fraser touches on the Remarkable Providences of Christian Science, the dangerous ideas that refuse to die. Mesmer and his magnetism, Quimby’s therapeutic touch, Ms. Eddy and her malicious animal magnetism. All that is old is new again, and once again quackery and Christian Science are being repackaged as alternative healthcare. Although my edition of God’s Perfect Child was published fifteen years ago (2000), Fraser’s concluding thoughts continue to ring true. The Committee on Publication and Practitioners have taken to the internet and done their best to sell Christian Science as a science, as a reliable method for healing, as everything that it is not. I think it is worth noting that God’s Perfect Child benefits, not only from hindsight, but also from a vast array of resources not available to turn-of-the last century biographers. God’s Perfect Child is quite dense, fully footnoted, and some sections are very difficult to read. Fraser is aided by her goal of writing about the history of the Mother Church/Christian Science Movement – not just Mary Baker Eddy. I was left with the overwhelming desire to purchase a huge stack of books and send them to every Christian Scientist that I know with the second chapter clearly marked as a MUST READ! Budget restrictions (and courtesy) prevent me from doing this, as well as the knowledge that God’s Perfect Child is not the sort of book that should be undertaken lightly, you have to be ready to be receptive to the information within, and even then, some times it makes for difficult reading.